Toyota’s Camry was the best-selling sedan in the United States last year, edging out perennial rival Honda Accord, but the best selling Toyota is the Toyota Corolla with more than 43 million sales worldwide in 150 countries. The 2018 Corolla is smaller than the Camry but both are classified mid-size with the Corolla now in its eleventh generation. Toyota claims it is the best-selling automotive nameplate of all time. Carrying the legacy forward, 2018 is little changed from 2017 when safety, value and reliability praise came from crash tests, Kelly Blue Book (KBB) and Consumer Reports. The 50th Anniversary trim has been discontinued. They currently offer six choices beginning with base Toyota Corolla L, LE, LE Eco, XLE (our test-drive), SE and top XSE. Standard on all trims is Toyota’s highly praised Safety Sense, a smorgasbord of driver safety aids including pre-collision braking, pedestrian detection, adaptive cruise control, lane departure warning/assist and automatic high beams but not blind spot detection. A rear camera is now standard along with illuminated mirrors on non-extendable visors. Our test drive added a single $525 option that included navigation, a larger 7-inch touch screen, voice recognition, Entune premium audio with Sirius XM, Bluetooth and other comfort/convenience features usually costlier or not available in pricier sedans. And when new Corolla purchasers sell their car, they will find top retained value, equaled only by the Honda Civic, KBB says. 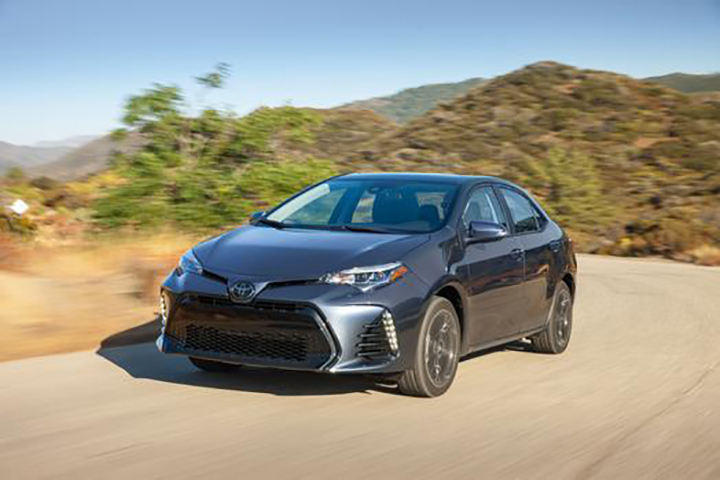 The 2018 Corolla XLE doesn’t have quickness but less horsepower translates to decent gas mileage and handling is responsive with electronic-assisted steering. The ride on 16-inch sport-designed wheels exhibits some jounce on rough roads. Corolla operates automatically in Eco mode with a smooth continuously variable transmission that holds rpms longer when sliding the gearshift left. The exterior is monochromatic with smooth lines, raked windshield, and a sliver of a grille above a huge maw-like one. Headlights are slanted and fog lights recessed – pleasingly attractive but not eye-catching. The interior is classically uncluttered with aluminum trim and chrome rimmed controls. All seating spaces are ample on faux-leather soft seats decorated with white stitching. Rear seats fold, adding cargo space, although there is some pinching above the rear wheels. There is a spare tire. Voice recognition is excellent, and apps are smart phone linked with Toyota’s vaunted Entune audio system. Gauge and touchscreen controls are legible and easily reached. With navigation, traffic alerts on commuter routes are helpful. Vehicle curb weight: 2,970 lbs.